In view of my mission to uncover true value in internet marketing products, I spent an evening browsing the selection on Amazon.co.uk. 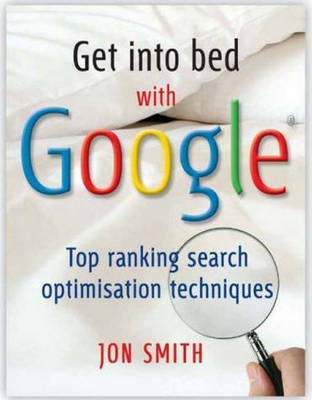 Jon Smith’s book – Get into bed with Google – Top ranking search engine optimization techniques continued to show up and grabbed my attention. “Get into bed with Google” – perhaps I’m easily bowled over, but what a name. For the grand price of £6.49 (thank you Amazon Super Saver Delivery) I had the book on my lap in two days. Jon Smiths book divides up 52 SEO ideas and techniques into bitesize, two-minute chunks. Written in a ‘reference’ handbook format, Get into Bed with Google is an affordable, yet reliable source for referencing optimization information and guideance. So where to start? The publisher – InfiniteIdeas - is focused on publishing short, digestible ‘ideas’ books and hiring experts in the appropriate fields to write them. The ‘GIBWG’ book is part of the ’52 Brilliant Ideas’ series – the book divided up into 52 two-page chapters introducing – for use of a better word – ‘bitesize’ introductions to search engine metrics and website optimization. In hiring an expert, Jon Smith was called in. Jon’s web experience began when he found himself on the launch team for a little known company called Amazon when they were setting up there UK division. He subsequently appeared as project manager and head of development at Kitbag.com – which remains Europe’s largest online sports retailer - Service Development Manager for TheFloristExchange.com, setting up ‘Toytopia’ to challenge the might of Toys ‘R’ Us amongst other things. You can read his full biography on his website. Jon’s background in web development from the early days of the internet, particularly in e-Commerce made him a natural candidate for the book. Each chunk of the book is completely divided into sections. Unlike perhaps a novel where you will see an introduction, development, climax etc. each chapter is very much in reference format. The short chapters and paragraphs are to the point – you can finish each “brilliant idea” in two minutes and be able to digest it. Each chapter cumulates with a “here’s an idea for you” which is essentially your action step advice. You’ve learnt the theory; now put it into practice. It also includes some helpful, relevant resources. When I read it, I ran straight through from cover to cover which is probably the best way to get accustomed to the book and the ideas – but then keep it on a shelf and use it for reference. The index is very comprehensive and you can easily navigate from section to section. The book itself is relatively small and only 180 pages long. I finished it in the evening I got it; thereafter living on my desk acting as my little SEO handbook. Would I recommend this book for complete newbies? Perhaps not. There wouldn’t be a problem, but the lack of a linear structure and how it can relate to you forming an SEO strategy – but there would be no problems. You don't need to be a programmer to understand what he's saying! Very handy reference guide, although the lack of linear structure may not be best for some beginners. TOP TIP - Take a look at the standard price, but also look for cheaper ‘New and Used’ books from the Marketplace selection. Watch out though, since shipping will always be added on top of these items.